The Salinas Youth Initiative invests in the homegrown, passionate East Salinas leaders who are giving back to their community by serving children and youth during and after school. The gymnasium at Alisal High School in Salinas is loud and hectic. Pharrell Williams’ “Happy” blares from the sound system as more than 100 boys and girls age 4 to 12 shoot, dribble and practice their crossovers. In the middle of the chaos, Coach Jose Gil, wearing a tracksuit and microphone, leads the warm-up exercises. The kids stride across the gym, doing a series of lunges. “Now reach for the stars,” Gil says and the kids, each wearing a black-and-yellow jersey with the number 1 on the back, stride and leap, stretching their hands high in the air. “Eyes! Ears!” Gil commands and the hubbub quiets as his voice echoes across the gym. Welcome to Monday night practice with the Gil Basketball Academy, where Jose Gil, a son of East Salinas, is “living the dream” and sharing it with his hometown. Gil, a graduate of Alisal High, came back to spread his passion for basketball and provide alternatives for the young people of Salinas. While he’s at it, he aims to change the city’s image. 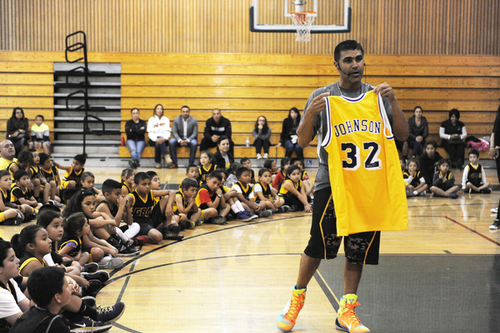 During the final regular session of 2014 at Alisal High School in Salinas, Gil Basketball Academy founder Jose Gil, right, holds up an autographed Magic Johnson jersey to be raffled off. The academy—known to all as GBA—is a family affair. Gil, an all-star player on Alisal High’s 1989 championship team, returned to the school in 1997 as an art teacher and basketball coach. Eva Silva, Gil’s wife and GBA co-founder, played varsity ball for the Alisal High girls’ team and was the 1990 class valedictorian. Their three children, 13-year-old Josue, 9-year-old Samuel and 6-year-old Nayeli all play in the academy. That first group of kids included Ulisses Mendoza, then a 1st grader and now a 13-year-old point guard with an easy dribble and smooth moves. “Coach got me into basketball and I didn’t stop,” Ulisses says, as he waits for the second part of the night’s practice, for kids 13 to 17. He credits his passion for basketball—and his need to get good grades to be allowed to play—for helping him stay motivated at school. 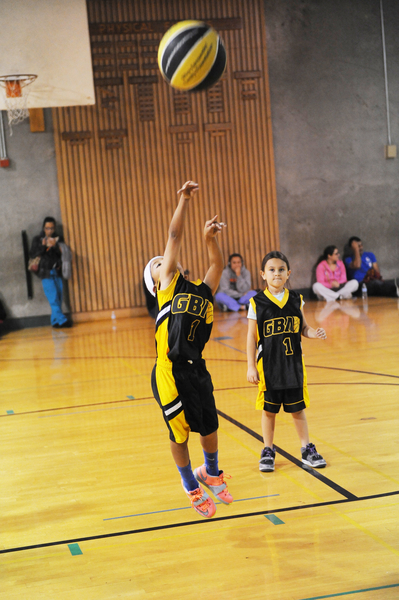 Taking a jump shot like a pro with a full-size ball, this young player will develop fast. 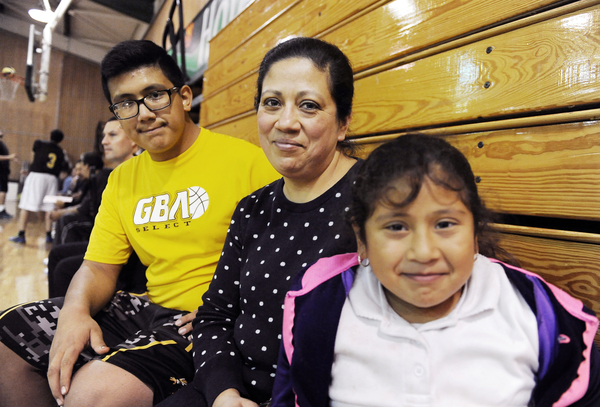 Being part of the basketball program gives kids like Ulisses more confidence and “that transfers into the classroom and into their lives,” says Silva. The academy also gets academic progress reports from the teacher of every kid in the program. If kids aren’t doing well, the academy’s coaches will talk to them and their parents. Sometimes, Silva says, parents will have kids come to the practice and do their homework instead of participating as a reminder of what they’re missing. Eighty girls and 265 boys took part in the Academy this year, three-quarters of them from the 93905 ZIP code of East Salinas, an area that is becoming known for something else: basketball. The program has also organized trips to Costa Rica, New Zealand, Hawaii and the Dominican Republic, where kids get to play basketball and experience other cultures. Parents, board members and volunteers do fundraising to help pay travel expenses. Over in the school’s multipurpose room, Gil and Silva are chasing the “little dribblers”—the 4- and 5-year-olds—as parents smile from the sides. “You gotta dribble,” Gil shouts. “What’s it called if you don’t?” “Traveling!” yell the kids. The number on their backs is no accident: In their coaches’ eyes, they’re all equal, and they’re all number 1. Isaac Dueñas, a 7th-grader at El Sausal Middle School, gets plenty of support from his mother, Leticia, and little sister Emily, 8. Fourteen stories crafted by writer and photographer Jay Dunn and journalist Rob Waters, feature the spirited children and youth of East Salinas as well as its passionate and home-grown leaders. The stories highlight programs participating in the Salinas Youth Initiative, a focused, place-based approach providing East Salinas youth with safe, academic and athletic enrichment opportunities, funded by The David & Lucile Packard Foundation in partnership with the Community Foundation for Monterey County. Return to The David and Lucile Packard Foundation.